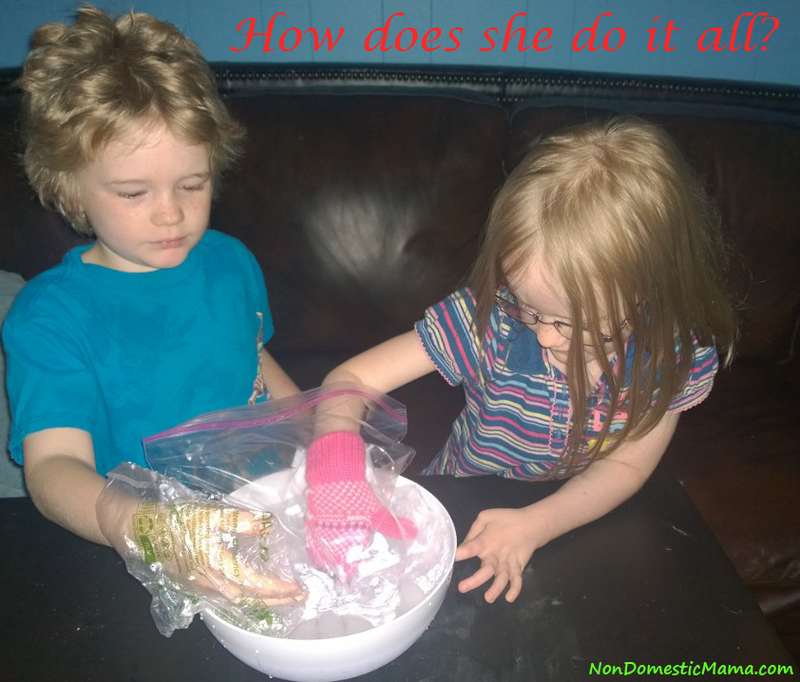 Non-Domestic Mama: How Does She Do It All? Ever find yourself asking that question? You look at another mom and she seems to have it all together. She manages to do all the things and balances everything flawlessly. She is perfect in every way. So calm, cool, collected. She is the perfect wife and mother. She is the person who actually does the things she pins to Pinterest. Heck, she is the one creating the things everyone else is pinning. She is the mom who works full time from home while homeschooling her ten child prodigies. Her genius children are also great athletes, always well behaved, polite, helpful and very popular. She is the mom who sets the fashion trends and always looks fabulous in clothing she designed and sewed herself. Some of the rest of us are still in pajamas and can't even find time to take a shower. Her impeccable house has been featured in magazines. She organizes events, does charity work, is in perfect shape and cooks her own delicious gourmet recipes using healthy ingredients she harvests straight from her own garden. To top it all off she is even pretty too. And you just can't dislike her because she is such a kind giving person. All this and more. She does it all effortlessly and is perfect in every way. Don't we all feel like we know that mom? We find ourselves asking, "how does she do it all?" Ever been asked that question? Believe it or not, I have. And it wasn't even asked sarcastically! Stop laughing. I am being totally serious right now. Alright, you can laugh. I know I sure did! Of course it was by someone who hasn't seen my house. I homeschool my two children while babysitting during the day. That's it. That was enough to prompt the question. I guess I can see from external appearances how it might look (at moments) like we have it at least partly together. Thanks to my kids being old enough to mostly feed and dress themselves and the fact that they are in Religious Ed classes that end right before Mass, we manage to be at church on time most Sundays. Thanks to many "What I Wore Sunday Linkups" in a struggle to keep my blog whimpering along, we are usually even showered and dressed nicely for Mass. Now that I am an assistant catechist we even manage to be on time for RE class. I assure you this was not always the case! After years of belting out the Star Wars Imperial March during the quiet part of Mass (Peanut) or simply screaming so loudly I had to stand outside the church for the entire Mass (Princess) my kids usually sit relatively stillish and at least keep their talking through Mass at a whisper level. Usually. I get compliments from people who see them walking hand in hand to the Children's Liturgy. They are so sweet and loving. And I make sure they don't sit next to each other at Mass, lest we shatter that illusion. Doing it all. A science experiment and the creation of a pin worthy image!! Let's just imagine it always looks this way. Just ignore the two bickering, unshowered, pajama wearing children who are currently running in the house while not cleaning up the mess they were told to pick up. Pretend I don't sound totally distracted and (I can't even make my brain work enough to find the word I want to put here over top all the screeching noises being made right now in what I can only assume is a conspiracy to wake the sleeping baby) umm, disjointed that's it, because I have had to stop writing mid sentence fifteen twenty times or so to answer random questions, praise projects, kiss owies, lecture, redirect, feed, comfort, threaten, discipline or physically pull them off each other all while taking my one phone call of the day. Disregard the ten minute frantic search we made for a missing school book yesterday, only to discover it was on top of the Princess's desk the entire time. Because her desk is already such a mess it was totally hidden in the pile. Look at the completed school work and not at the overly optimistic project ideas we never got to. Don't look at the chaos and panic as we are all yelling at each other trying to get out the door on Sunday morning. And please overlook the fact that I have almost forgotten how to pay attention to any of the actual Mass because I have gotten in such a habit of keeping an intense, eagle-eye focus directly on my children the entire time. We'll just keep that part of the picture concealed. I guess it's pretty easy to look at someone else's accomplishments and see all the things they are doing right and compare them against your own shortcomings. We look at other moms and make a mental list of all the things they are doing right. Or at least appear to be doing right. But what kind of list do we make when we look at ourselves? It's like making a three page to do list for the day, accomplishing two pages worth and at the end of the day looking at the one page of things you didn't manage to get to and labeling yourself a complete and utter failure. We just can't seem to see all the things we actually do succeed at. Instead of congratulating ourselves on those two completed pages, we stare mournfully at the third page. Count up our misses. Then point at the two checked off pages of that other mom. See, she did the things I didn't do. Obviously she manages better than I do. The truth is, no one can do it all. We each have our own strengths and talents. We each excel at some things and fall short in others. We are all striving to do better. Imagine an expert architect looking at a talented fisherman and thinking to himself, "If only I could fish, then I would be successful." Then he throws all his time and effort into learning to fish rather than building great cathedrals. Rather than just buying the fish from the fisherman, supporting the fisherman's trade, and focusing his time and attention on his own responsibilities, he neglects his business and ends up frustrated and hungry because for all his effort, he still lacks the skill to catch a fish. That's one of the reasons we live in communities. So we can benefit from each other. We can share our talents and be blessed by the talents of others. Though I am still pretty sure that one mom, she is perfect. Now if you will excuse me, The Princess just spit in the Peanut's hair.